No matter how small your small business, routines are what are your best return on investment. Routines permeate your small business, whether it is how you track clients, take payments, or thank your clients. Its worth an investment in your time to be sure your small business routines are working well. Client intake is your first steps in business success. You have done your marketing and your clients are contacting you. Clients call, send text, email and meet you at an event. I have seen client contacts on back of paper plates too. When there are so many ways to connect, it’s up to us as a small business to streamline how to track incoming clients. I am a big fan of consolidating this incoming information. Consolidating can come in the form of adding this information to a single sheet of paper or adding this information digitally right away. Give yourself a time each day and each week to consolidate this information from all the incoming spots, create a paper or digital folder, and take next steps with the client information. Is your next step an appointment with your client? If so, be ready with your paper planner, Outlook or Google calendar or your online scheduler. How to reinforce this routine for yourself? You can start with a checklist to remind you of the steps. Your client checklist can be online or on the front of the client folder. Taking payments and paying bills are important routines for all businesses. Have an established date for both of these. For payments, determine the frequency of deposits. Again, funds come from many sources such as paypal, square, checks and venmo. Good financial routines include more than bill paying. It includes setting aside and paying taxes at the set dates, reviewing budget and expenses, and looking at your best return on investment is for marketing. Calendar the dues dates of taxes to be sure you pay timely. Review your budget and expenses monthly with a monthly money date. Your marketing budget is one of your most important expenses. Know where you are getting your clients from in order to budget accordingly. Each of these dates gives you a heads up on your success and also details to know what to keep doing and what to change. One last note about an important routine I practice. My goal is to keep my clients for the duration. We are in a lifelong journey with organizing and productivity. As such I send a thank you note at the end or at a break when we work. I also send an annual thank you for the holidays. Keeping this list updated is a final step of my routines with clients. It’s one small way to keep connected. There are so many ways to start and maintain routines. There’s no time like now to review these. Think about the steps you have put into place, build on these and reward yourself for your successes! Your business will be all the better for this work. More tips here on routines. Join my newsletter! Social media has made it a little too easy to think we are connected. We connect on LinkedIn, Facebook and Instagram daily. However, there’s nothing like meeting in real life. Online, there are so many options and places to learn. In an virtual world, it’s less expensive to learn too. There’s two big reasons to attend our national association NAPO conference. If you are cautious about money, it’s always a wise investment to network in person. Face to face, we are our most genuine and authentic. There’s no hiding our connection to other with in person networking. When you attend a conference, you are expanding your connections to potential clients. Networking is when you share your authentic self by sharing what you do, who you are and your brand. Each time I attend a NAPO conference, I have made more connections than I as an introvert could imagine. There’s connections in sessions, at meals, in the hallway, in the elevator and on the dance floor. You are immersed in networking. Imagine dancing with 400 of your colleagues. In each of these ways, I made a lasting connection that I can share or recieve business. Attending an in-person conference gives you opportunities that are not available online. Presentations specifically developed by my peers gives me an edge. They are the experts in our field and they craft their presentations to our specific industry. As a visual learner, being in a classroom setting offers me the opportunity to immerse myself in the topic. I see the presentation and process it by sharing ideas with my colleagues also attending. When I attend an in person conference, I love that I have no other distractions in my space and I can fully immerse myself in learning. It’s a gift to have no distractions and to give full attention to learning. As an 18 year veteran, I have much to learn! I love new perspectives, new technology, new concepts and new skills. Classes include working on my business and working with clients. I also confirm and consolidate existing skills in these sessions. I am proud to be a prolific learner and share all that I learn with my clients. Yes, attending an in person conference takes time away from your family and business. It’s an investment in yourself, your work and your learning to take the leap to attend an annual conference. Take the leap each year and attend our NAPO National Association of Productivity and Organizing Professionals Conference. I am an Organizer Coach now! I have always valued education because furthering my skills makes a difference for my clients. My clients are the reason I continue to learn new ways to help them let go, streamline and keep their intentions daily in their lives. Completing my Coach Approach training is one way for me to empower my clients with their home, work and life goals. I am an Organizer Coach who works one on one with clients to empower your change and goals. For the past year, and several years before, I have been taking classes via phone, working on skills in small groups, and completing a curriculum to become an Organizer Coach. My classes and reading have included learning about modalities, using new tools to help my clients such as a values and needs assessment, and learning more about ADHD, depression and anxiety. Throughout the year I have coached or been coached in 3 different small groups to practice my skills and learn what it is like to be coached. How do these new skills help you, my client? Are you stuck and can’t get started? Coaching supports awareness, action and learning. Your new awareness will lead you into action. Getting started and finishing up are often holding back my clients until we work together. Learning comes from perspectives at your success. Overall, coaching supports maintaining the change you have created. Need a trusted coach to listen to you? I believe in the strengths of my clients. You bring thoughts and ideas and my listening brings focus to our work. Your values, needs and strengths are all a part of our work together. Do you feel overwhelmed and paralyzed? Your strengths are the foundation of organizing in your home, work and life. It’s easier to maintain the systems you establish by working from your strengths. Do you struggle with ADHD or anxiety? Brain based conditions, such as ADHD and anxiety, can impact your executive function and your goals. Our work together will move you forward as you create new awareness and learning. Have you created support for your efforts? Essential structures, such as self awareness, support and education are the baseline for your life. Together we investigate how these essential structures support your organizing goals. It’s been a busy year with training through Coach Approach, a coaching skills training program designed specifically for organizers. I want to thank my trainers Denslow Brown and Cameron Gott, as well as my colleagues in training with me. https://professional-organizer.com/WordPress/wp-content/uploads/2016/07/logo.png 0 0 Ellen https://professional-organizer.com/WordPress/wp-content/uploads/2016/07/logo.png Ellen2017-06-22 06:00:592017-06-25 13:05:40I am an Organizer Coach now! Being a small business owner typically means wearing many hats. You are CEO, Marketing VP, Finance Director and worker! It’s not surprising that organizing may be a lower priority, especially administrative tasks. By having routines you are going to be more successful each day. By creating organizing routines, your productivity and organizing will soar. Here’s how small business organizing routines an help small business entrepreneurs. If we start the day with a routine, we are going to get on track easier. It might be your morning spiritual moment, exercise, or eating protein, a great morning routine makes you be on time for work, be your best when you arrive at work, be focused and put a positive spin on the day. When you have a specific day of the week with a specific focus, you can get more done. Focus on your plan on the way you work best. It might be Financial Friday where you enter or download your Quickbooks. Getting to work early or staying late often means uninterrupted work time. By assigning a certain day of the week that you go in early or stay late, you can make plans and be more productive. It may be the time you do your best thinking this way. The end of your day sets the stage for tomorrow. My colleague Janice Simon calls it the “closing ceremonies.” Wrap up your day with notes to yourself for where you are leaving off or a reminder for tomorrow’s most important tasks. Finish up with a zen like desk clearing and leave nothing on your desk. When you return, you will find clarity and motivation as you welcome the opportunity of a fresh start. Your small business will thrive as you incorporate these routines. Check out more tech tools and other here. Join my newsletter for more on routines! Our digital life includes documents, spreadsheets, PDF docs, and photos. Add in items that are saved in the cloud. You may be saving files to your desktop or keep files attached in your email. All of a sudden we are digitally disorganized! Simple, electronic organization is a must when it comes to keeping our digital files organized. Digital organizing is just like physical organizing. Think about the big categories of digital files to organize. The big category of files should reside on your PC, Macbook or cloud based filing system. Why? Because like with all organizing, consolidating is important. You want one spot to look for all these files. Backing up is a critical safety factor. You can use your cloud based filing system with a strong password, an external hard drive, or a specific back up system like Carbonite. Whichever you choose, be sure you are backing up regularly. Digital and paper file systems have a lot in common. Starting with broad categories makes it easy to file and easy to know where to find information. Think about what applies to your business as a big category. You can also sort by year if that’s easier. Choose categories that make sense to you and can be easily remembered. If not, you can also print your folder and file list for reference. Create a file within the folder for more specific categories. In your Home folder, it might be Jeep and Lexus are the file names. In the Financial folder, you can create files for Retirement Merrill Lynch, Utilities 20XX, or Banking Compass. For your photos, you can create files by event like birthday, travel or year. If you save to your desktop, you can copy/cut and paste into your new document folder you created. If documents are in your email, open and save as to the new file. If you are saving a photo, cut and paste into the new file. It’s easiest to create the folder before you scan. Then simply choose PDF and scan to the folder you need. Remember, not EVERYTHING is scan worthy. You don’t have to scan in previous documents. Start by going forward with scanning new documents and catch up later. Remember, keeping it simple makes it easier to file anything! Having a great tool makes any job easier. When it comes to productivity, your tools help you become more aware of what you accomplish and help you staying focused. These are 3 of my favorites for both home and work. RescueTime runs in the background of your computer all day every day. It tracks time spent on applications and websites, giving you an accurate picture of your day as well as detailed reports. The tools also permits you to block certain elements to be sure to stay on task. RescueTime gives me an analytical view of how much time I spent on my computer on different projects. With new perspectives comes changes in behavior. StayFocusd is Google product that helps you configure your access to different websites and the internet in general. It has a timer that helps you set amounts of time permitted online or on specific sites. No more surfing the net or looking at social media rather than getting your work done on the computer. It’s difficult to undo too! We all have goals, but some are much harder to achieve. That’s where Stickk comes in. With commitment comes goal accomplishment. Stickk has a commitment contract to help you acknowledge what it’ll take to accomplish it, and leverage the power of putting money on the line to turn that goal into a reality. You can track your progress, post images your journal and invite friends to commit to accountability. These three tools are just some of the tech ways to help yourself be more productive. Not all of my tools are tech and some of my favorites are simple notebooks. Whatever is your trusted tool, work with that. Check out my pinterest page High Tech and Technically Organized. The best businesses practices include team work. You and your colleagues work together for the best possible outcome in revenue generation and efficiency for keeping costs low. Not surprisingly, 96% of executives cite lack of collaboration and ineffective communications for workplace failures (Salesforce). It’s about how well you do your job and how you enhance the efforts of your colleagues that is the best of a team effort. 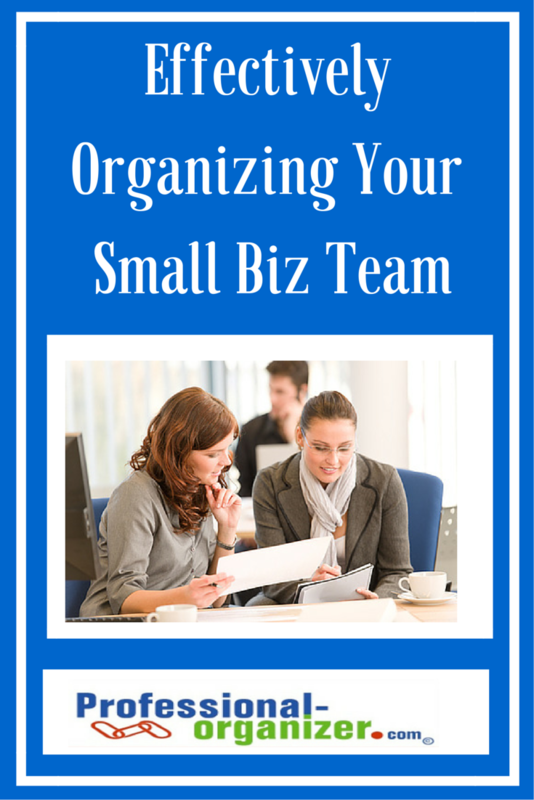 Effectively organizing your small business team includes strategies for communication, delegation, and collaboration. Team work relies on clear communication between you and your colleagues. There are many ways to communicate with your team. What’s most important is to keep the lines of communication open. Be open to all collaborator’s ideas and truly listen to all team members. Set expectations for communication in the beginning by establishing email, meeting and phone protocols. These protocols include who to “cc” in an email, what responses to expect during a meeting, and when a phone call is required. Setting deadlines enhances communication. Everyone knows what the next step is and when it is to be completed. Ask for input from colleagues for communication methods and deadlines and they will be more buy in as a result. Delegation is not only turning tasks over to others. It’s a way of getting more done efficiently and effectively for a team. Delegation is a learned skill. For some colleagues it’s more natural than others to ask for help, delegate or find resources for a team. Delegate by knowing the strengths of your colleagues. It could be a technology skill, a great researcher or another quality that makes your colleague stand out. Remember that you are not looking for a colleague who does this work just like you or one to do the work “perfectly.” Give clear instructions with a note to check in at a specific point. Collaboration is more than just working alongside a colleague. It’s engaging colleagues’ minds together to work in a trusting, goal driven environment. True collaborators feel they have contributed to the greater whole with a whole hearted enthusiasm. Leadership sets the tone for collaboration with a clear process for working together. Collaboration and delegation are easily accomplished using technology tools. Free apps including Trello and Asana promote both by assigning tasks and deadlines to each team member. Trello is a list of lists where attachments from dropbox and google drive can be integrated. In Asana, tasks are recorded and assigned, with a deadline. Collaborators can view your completion of tasks. Check out more useful Small Business tools here! What’s most exciting about small biz team work is the outstanding outcomes. When more colleagues tap into the powers of team work, there’s more energy, enthusiasm, positivity and income. More ideas here! Pinterest Small Business Organization! All the signs point to summer time is here! Our weather is warmer. Pool season has started. Days are longer. There are lots of ways to celebrate the arrival of fun in the sun. 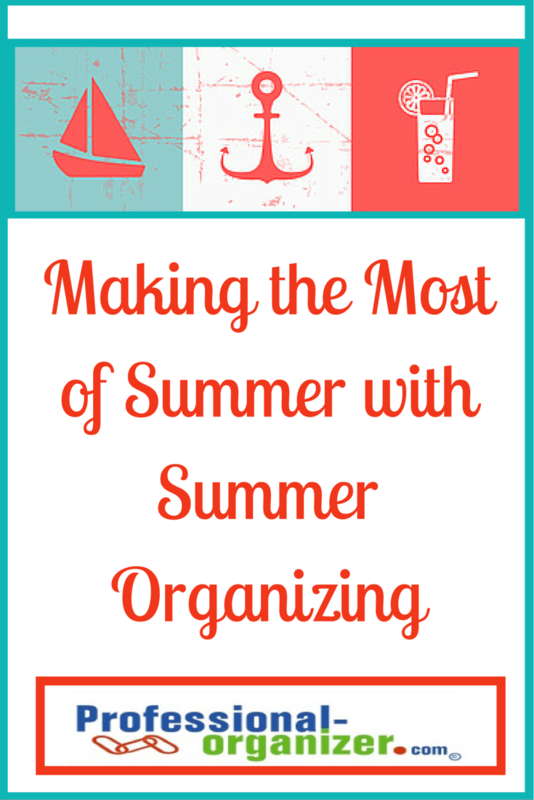 Summer organizing helps you make the most of summer fun. Start off the season organized! Switch out your seasonal clothes. It’s time to release those winter items that were not worn in the last few years. Move your summer items into your primary closet and organize them in a way that work for you, whether its by color, sleeve length or set. Use a bin for flip flops and organize your shoes so you can see them best. Replace your winter linens with summer light weight cottons. Swapping to lighter weight linens gives you the opportunity to clean your bed covers. Eliminate extra decorative bed pillows and freshen up the look of your bedroom. Give your pantry the once over. During winter we cook differently. Think of fresh new menus and ways you can start a new plan for eating. Mark your calendar for your grocery runs that will include fresh fruits and veggies. Set up outside areas. Scrub down the patio or have it power washed. Freshen up outdoor seating cushions and furniture. Add in patio lighting, candles or lanterns. Create a pool toy play bin to corral balls and floats. Be ready for outside fun with storage designed for outside toys. Get your activity bags ready to go. Create travel or activity bags for you and your kids. Your bag can include chargers, reading material, sunscreen, bug spray and other goodies while you watch your kids at swim team. Your kids’ bags include whatever they need for an activity. Have one bag per activity so everything is ready to walk out the door. Pick a single flower from your garden or pick up a small fragrant herb from the store. Bringing in the smell of the outdoors is a great pick me up in the summer. Start off summer with a plan. Host a family meeting focusing on vacations, camps and time at home. Write your family’s plans on your family calendar so everyone is in the know. Add in preparation times, when you will be packing and unpacking. Make a list of what you need to purchase to be prepared for your outings. Discuss what family time routines will be maintained or added this summer. A little structure goes a long way during the summer. What will be added responsibilities? What time will bedtime be? What are ways to keep up with reading and math? Having these conversations now set the stage for summer success. Once decided, create a chart or online reminder system to keep your family on target. Scout out additional resources for summer supervision. Are there neighborhood teens, additional baby sitters or ways to add time with grand parents that can help you in a pinch? You will be ready for extended meetings or other delays just in case. Check out new collaboration tools that you can use to work at home. Dropbox offers you access to your files at work from any device. With Skype you can have a face to face conversation using your device. LastPass keeps all your passwords accessible and organized from anywhere. Join.me allows for screen sharing. Evernote keeps you organized with your lists. 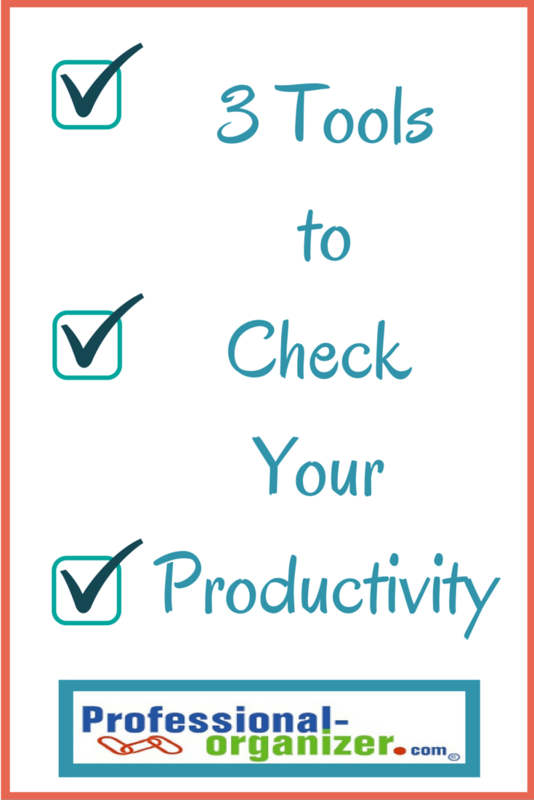 Just one of these tools could be a bonus for your productivity this summer. Take time for real vacation and create real rejuvenation time. According to The Energy Project, 59% of of workers are physically depleted, emotionally drained, mentally distracted, and lacking in meaning because they need time away from work. If you are away, post an auto-response giving a heads up. If you check email while away, keep it to a minimum. Create space for what you love to do this summer. Read some of the magazines or books poolside that you have collected all year. Enjoy time for a pedicure, exercise or cooking. Summer is our time to play! Best of all these summer organizing projects can be chunked down to one hour time slots. You can enjoy the day and not be bogged down all day with organizing. Make this your best summer ever with your summer organizing. More organizing ideas monthly! Join my email newsletter! As a business owner, we all want to find simple technology improvements that can make life and work easier. We see the value in using technology to its fullest. We seek out new technology options. Not long ago, wireless technology was a thing of the future and now two-thirds of small businesses use it unfailingly. 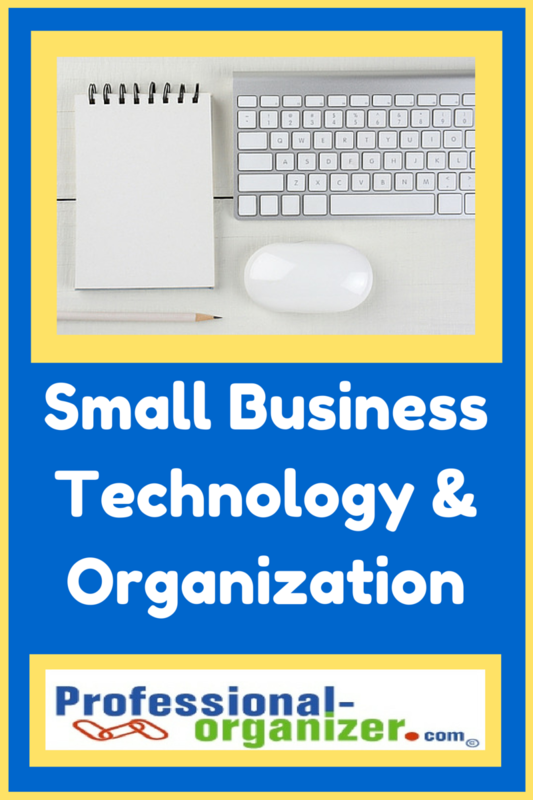 Just a few small tweaks to our small business technology helps us in a big way. Do you take advantage of the cloud? A major trend is the use of the cloud. Did you know that 92% of all small businesses have adopted one cloud based solution? Options like Google drive, Dropbox and Box are used to store and retrieve files. The ability to store, sync and retrieve files across many platforms is a simple, smart way to efficiently run a business. Are you using a scanner? Take this to the next level using a scanner. Think about using a cloud based solution combination like Neat Connect to scan and store documents. You are on the way to a paperless office. There are fewer hassles finding and filing important documents. There is less manual entry and more automation. You feel less stress about shuffling documents between co-workers. Do you market with social media? Social media sites like hootsuite and klout make it easy to reach your audience. You can post to Facebook and twitter by scheduling your posts. Klout recommends articles of interest to your audience. Take your social media marketing to the next step using these tools. What apps apply for your small biz? Using programs and apps that are available on smart phone, tablet and computer make powerful use of technology . Apps like Evernote and Notes help us increase efficiency with task management. Using social media across platforms helps us leverage our marketing. Apps can help with simple small tasks too. Expense reports and taking payments can be easily managed with Expensify and Square. Neat combines the power of your desktop, your tablet, and your smartphone creating a system that helps with accounting, contacts and documents. We all have favorite apps. Add your’s below. Finding the right combination of apps for your small business makes small business work more manageable. Seek out new technology with an eye for automation. Keep open to find solutions to challenges you are facing through finding solutions within technology improvements. Ideas for your small biz on Pinterest. Join my newsletter for more ideas on productivity and your small biz. It’s that time of year when tax papers flood in. It’s the last task we want to do! But it’s much easier if we are organized. Tax papers arrive throughout January, February and March depending on IRS requirements. Many expenses occur all year that are tax expenses and deductions. If you have struggled with organizing your tax receipts and keeping up with tax documents, here are two options for you. Many people have a designated location that holds their tax documents. It can be an actual drawer, a file in their cabinet, or a box once the year is over. Throughout the year, various tax documents arrive and are stashed in this spot. It’s a habit cultivated over the years. It serves you well as you always know where your papers are. Once the files are accumulated, organize them into categories and total them, possibly with an excel spreadsheet so that you know general total. It’s the 21st century and scanning your tax papers is the way to go. Not only can you scan tax documents in all year, you can track and categorize them. You can share these files with your accountant by sharing access to Dropbox where your tax files can be located. Tax information is easily accessible when you need it. There are lots of choices for scanning, including your ipad, multi-function printer, Neat Desk or Fujitsu SnapScan. Keeping your papers digitally means you will never lose them. Tax time can be less stressful knowing where all the documents you need are. 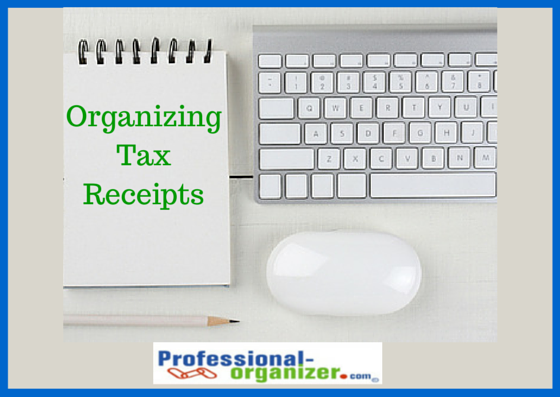 Get started organizing tax receipts today to make this year much easier.